TODAY WILL START dry, but will see heavy, thundery showers set in this afternoon. 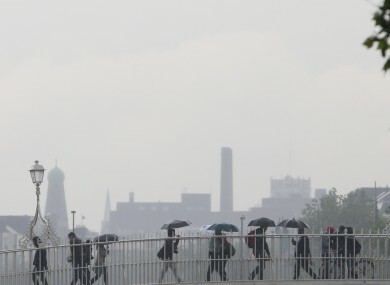 That trend looks set to continue across the weekend, Met Eireann says. The weather service says today will start dry and sunny in the east, but thick cloud will bring rain in the west. While temperatures will climb to 14 degrees, rain will set in over the afternoon. “In the afternoon the rain will become widespread as it moves eastwards across the country and by evening will start to become heavy, with possible thundery downpours. Tomorrow will be mainly dry and sunny, but more showers will develop, mainly in the northwest and west. Temperatures will reach around 11 degrees. On Sunday, showery rain will develop, but Munster and Connacht will stay largely dry. However, temperatures overnight on Sunday are unlikely to fall below seven to 12 degrees in an unusually mild night for the time of year, and it will stay mostly dry too. That mildness will continue until at least Tuesday. Email “The weekend is set to be cold and rainy”. Feedback on “The weekend is set to be cold and rainy”.